Superheavy’s new album SuperHeavy is released on Monday 19th September . It is a collaboration by a group of diverse musicians assembled by Mick Jagger, The band features Mick Jagger, Dave Stewart, Ziggy Marley, A.R.Rahman and Joss Stone, and as you’d expect from such a diverse line-up of musicians the album features a wide range of different sounds, from Rock, folk and Bhangra to Reggae and soulful ballads. The result sounds great and They all sound like they had great fun making the album. 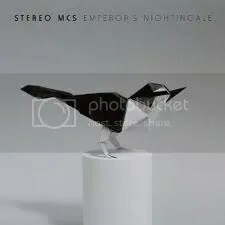 The Stereo MCs new album Emperor’s Nightingale is released on Monday 19th September. I thought the other albums like “Connected” and “Deep Down and Dirty” were incredibly groovy and funky, so I would like to get the new one. From what I’ve heard so far My Favourite songs off the album are : Phase Me, Far out Feeling, Bring it on, Sunny Day, Manner and Desert Song. It’s an awesome album apart from Wooden Heart, which I think is a bit depressing, still it might grow on me.